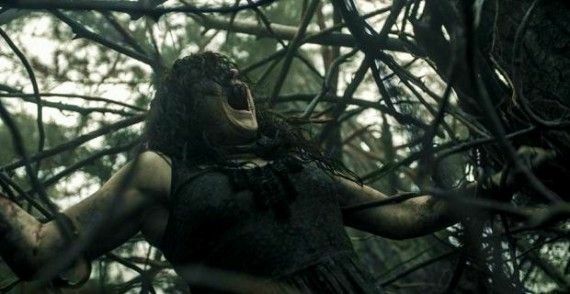 Fede Alvarez's Evil Dead remake was met with a lot of split reaction from audiences (read our review), but the film nonetheless met all the necessary financial requirements to necessitate a sequel. In fact, months ago, Alvarez spoke about his intentions for the burgeoning reboot franchise going forward, saying that he'd like to eventually tie his own movies in with Sam Raimi's currently germinating Army of Darkness 2. But all of his well-laid plans have come to a very abrupt halt, because Alvarez - as well as co-writer Rodo Sayagues - are no longer onboard with the Evil Dead 2. The announcement comes as a surprise for several reasons, the least of which being that Alvarez has been chatting about progress on the film since March's SXSW festival; Evil Dead's box office alone should have secured his place on production, and whether you admired his efforts or not, this turn of events still comes off as sudden. Describing this development as "unexpected" would be a huge understatement, but there's definitely truth to what Sayagues is saying. Alvarez has a lot on his plate: at the moment nothing appears to have come out of his rumored meeting with Marvel, but he is currently in the running to turn Dante's Inferno into a big screen feature; in addition, Alvarez and Sayagues are currently working on a number of different endeavors together. That's a lot of distractions, so it's easy to see how they could be unavailable for Evil Dead 2. It seems unlikely that the film would get tanked wholesale by Ghost House; among the slew of commercially viable horror pictures in 2013, Evil Dead ranks toward the middle of the list, coming in far behind efforts like The Conjuring and The Purge in terms of revenue, and yet still boasting respectable returns ($97 million worldwide on a $17 million budget). Scrapping it seems imprudent, though perhaps the studio feels that Alvarez and Sayagues were too integral to its success to forge on without them. Regardless, it's impossible to say whether Evil Dead 2 is defunct or not; we just know that the minds behind the last movie aren't involved anymore. If there's a silver lining here, it's that none of this has impacted the momentum behind Army of Darkness 2, which Alvarez confirmed Raimi will direct. We'll keep you updated on the status of both Evil Dead 2 and Army of Darkness 2.